EJOLT partner Nnimmo Bassey from ERA has send us a press release from Friends of the Earth Netherlands in relation to the decades of oil pollution in his native country Nigeria, by the Anglo-Dutch oil giant Shell. By Friends of the Earth Netherlands. For the first time in history, a European company, Anglo-Dutch oil giant Shell, has been brought to court in The Netherlands for damages it caused abroad. The plaintiffs are four Nigerians whose livelihoods and communities have been massively impacted by Shell’s operations. Lawyers for both parties pleaded at a key hearing in The Hague today, with a verdict expected early in 2013. The court case against Shell’s oil spills in Nigeria has been filed by four Nigerian plaintiffs in conjunction with Friends of the Earth Netherlands / Milieudefensie and supported by Friends of the Earth Nigeria. “A positive verdict will have groundbreaking legal repercussions. It will allow victims of multinational corporations in developing countries to obtain justice in Europe,“ says Geert Ritsema, globalisation campaign leader at Friends of the Earth Netherlands / Milieudefensie. “Due to the poor maintenance of its pipelines and infrastructure Shell lets tens of millions of barrels of oil leak in Nigeria, with disastrous consequences for local people and the environment. We hope for a positive verdict. We hope that Shell will own up to its glaring pollution. We hope that justice will be done for the four Nigerians who sued Shell in The Netherlands,“ says Nnimmo Bassey, Executive Director of Friends of the Earth Nigeria and Chair of Friends of the Earth International. “Shell polluted with impunity and destroyed our livelihoods. Several years after the spills we still see and smell the oil and in some communities half of the population has respiratory diseases. Shell must now clean up properly and prevent more oil spills from happening. Justice has to be done here in The Netherlands and Shell must be held to account,” says one of the four plaintiffs, Eric Dooh from Goi, Ogoniland, Nigeria. The serious contamination of the oil rich Niger Delta has had disastrous consequences for the local people and their environment. Oil leaks regularly pollute the fields, forests and water. These leaks are a heavy burden on agriculture and fishing. 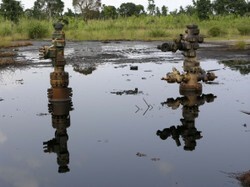 Shell is the operator of Nigeria’s largest oil fields and bears significant responsibility for the oil pollution. The UN, among others, has stated that Shell does not comply with legal environmental standards and has failed to clean up leaked oil – or has done so only insufficiently, for decades. Moreover, Shell’s own sustainability report stated that the number of leaks due to poor maintenance doubled in 2011, rising from 32 to 64.